Former New York Gov. 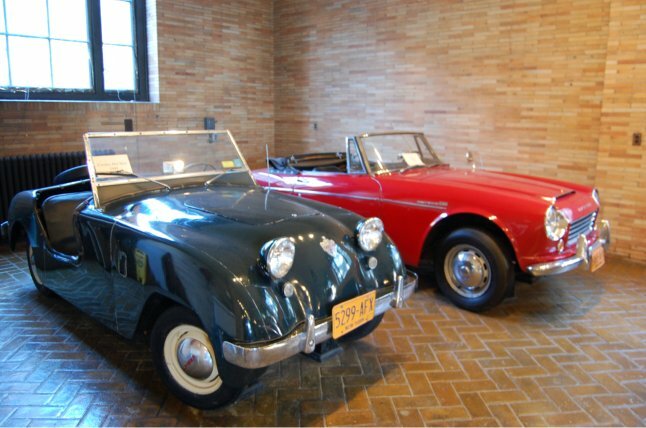 Nelson Rockefeller’s 1950 Crosley Hotshot roadster, left, on display in the Coach Barn at Kykuit. Last fall, as I wrote here, Mrs. F. and I spent a very nice afternoon at Kykuit, the Rockefeller estate in Sleepy Hollow. Among the many treasures there are Gov. Nelson Rockefeller’s extensive car collection. Displayed alongside the massive midcentury behemoths the governor used while in office is a 1950 Crosley Hotshot roadster. What killed the Hotshot was its engine, a dual-overhead cam .75-liter four cylinder, not cast in iron but brazed together from pieces of stamped tin. When these brazed welds let go, as they often did, things quickly got noisy, and hot. The Hotshot was manufactured until Crosley Motors ceased to be in 1952. The company had been founded in 1939 by Cincinnati industrialist Powel Crosley, who made his fortune manufacturing radios and owned the Cincinnati Reds. With the help of his brother, Lewis, he launched Crosley Motors in 1939. The cars enjoyed some popularity during World War II as they were relatively fuel efficient. After the war’s end, the line expanded to include sedans, wagons, coupes and roadsters. At its peak, in 1948, the company sold nearly 25,000 vehicles manufactured at two plants in Indiana and one in Ohio. Crosley owners included Omar Bradley, Humphrey Bogart, Pamela Harriman, Gloria Swanson, Frank Lloyd Wright and Rockefeller. This 1967 Sunbeam Alpine Series V is similar to one I saw in Buffalo over the Labor Day holiday. Driving north on state Route 5 on Saturday afternoon, en route from my in-laws place on Lake Erie to dowtown Buffalo, Mrs. F and I beheld a beautiful sight: A 1960s Sunbeam Alpine convertible that was painted racing green. It was a gorgeous vehicle. The classic Alpine of the 1960s has its roots in a 1953 version that revived a marque used by Sunbeam in the 1930s. The Rootes Group, which manufactured the Sunbeam brand after the war, opted to redesign the two-seated coupe in 1956. Designers Kenneth Howes and Jeff Crompton produced a lovely design that closely resembled the Ford Thunderbird. Aimed at the U.S. market, the Alpine appeared in five series through 1968. About 70,000 Alpines were manufactured. A V-8 variant, the Tiger, was produced between 1964 and 1967. A search on eBay motors yields four Alpines for sale, including the lovely green 1967 model pictured above. Bidding is up to $5,100. 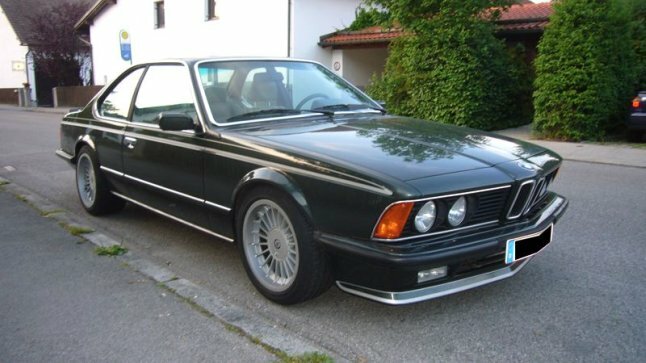 Circa 1983 BMW 635 CSI. A rather dapper gentleman who works as a recruiter for our paper and others in the northeast hangs his professional hat at our shop in Westchester. This guy rolls in style, literally. While he has impeccable sartorial taste — I’ve not seen him in anything but traditionally tailored attire — he also has excellent automotive taste. His vehicle of choice is an early 1980s BMW M635 CSI. Manufactured between 1983 and 1989, these models, commonly called M6s, are among the finer German cars of the period in my opinion. The shark-like nose and the extra-tall windshield and windows make it a very distinctive car. I was not at all surprised to learn that these and the standard 635 CSIs were designed by Paul Bracq, an automotive designer who cut his teeth at Citroen and later worked at Mercedes, where he designed the iconic 600, the limousine that appeared in “The Royal Tenenbaums.” The 635CSIs replaced the earlier CS and CSL models, both gorgeous machines in their own rights. I’m mildly obsessed with these at the moment. Anyone else agree? This 1976 Ford Bronco caught my eye last week. The Ford Bronco’s reputation, it seems to me at least, has been sullied since O.J. Simpson’s infamous slow-speed chase through Los Angeles in June 1994. I think that’s a shame, particularly because the first generation of Broncos, produced by Ford between 1966 and 1977, are a case in classic American automobile design. Conceived to compete with Jeep’s CJs and International Harvester’s iconic Scouts, the Bronco resembles the latter and was designed with simplicity and economy in mind. The windows and windshields were flat. The bumpers weren’t overly stylized. 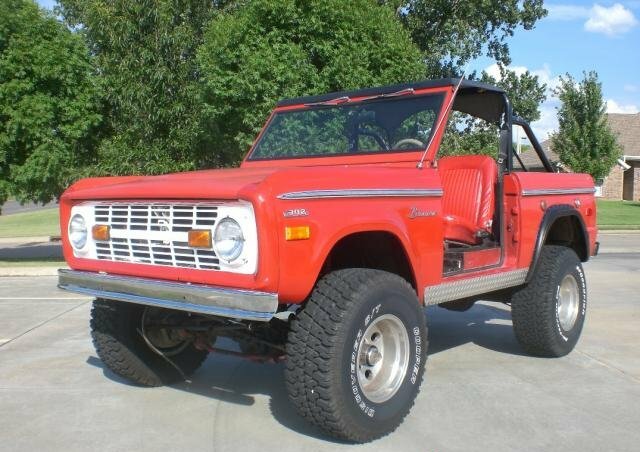 Impractical for towing but terrific for off-roading, today’s SUVs owe a lot to Ford’s pioneering Bronco. I’m particularly taken with the soft-top versions, which feature prominently in L.L. Bean’s campaign for its new Signature line of clothing and accessories. A quick search turned up this 1976 model, which relies on a Ford 302 V8 with about 55,000 miles worth of use. With replaced fenders and a new grill, this old reliable has only a few flaws. The seller admits that it leaks oil and power steering fluid and that there are some minor rust problems. I’m sure finer examples are available, but this one jumped out at me. With spring’s muddy days fast approaching, I’d love to get my hands on one of these beauties for a little trail riding. Wouldn’t you? The Mercedes 560 SL roadster is, in your writer’s opinion, one of the great vehicles of the 1980s. A trio of 1980s Mercedes-Benz 560 SL roadsters around Bronxville have caught my eye. Descended from the 1960s roadsters I’ve written longingly of before, the 560 roadster is a variant on the equally classic four-door 560 sedan of that was a 1980s luxury icon. While I haven’t quite figured this out, I believe these came standard with both hard and soft tops. A high school classmate’s father had a gorgeous forest-green 560 roadster and I can recall seeing it with both. The model pictured above, on offer in San Francisco, comes with both. In addition, the 1987 model at top features a 5.6-litre, eight-cylinder engine, automatic transmission, anti-lock breaks, power seats, locks and windows, and alarm system. Priced a bit high I’m told by my auto expert (see below) for a car of its age and mileage (73,000), it’s on offer for $21,500. 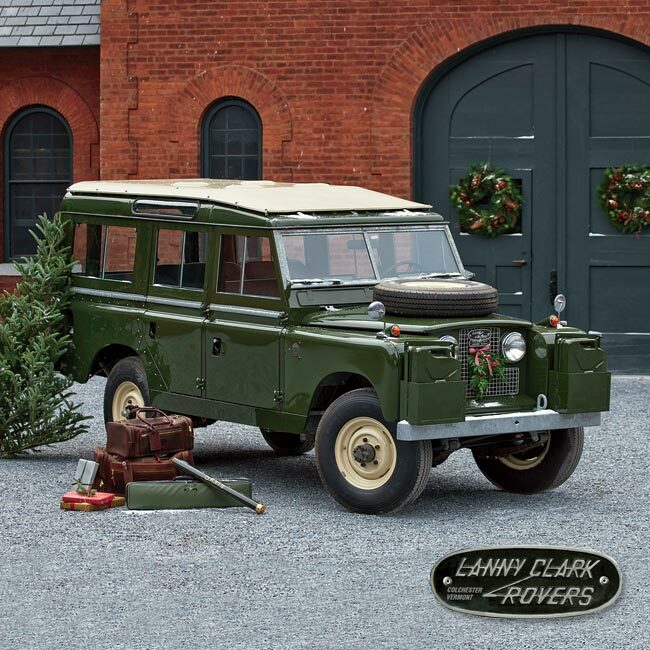 This restored 1962 Land Rover 109 was recently sold by Orvis. It’s no secret that our favorite decade here at ejforbes.com is the 1960s. This painstakingly restored 1962 Land Rover 109, which Orvis recently sold for $5,000, is another reason why. There are few places this car can’t go and few places it hasn’t been. You can own this one-of-a-kind original and set off on your own adventure complete with Orvis Bullhide Club Bags, a Helios 865-4 Mid Flex outfit, and a Safe Passage Carry-It-All Rod and Reel Case. Built in 1962 and then customized by Martin Walter Ltd. for extended travel, this Series IIA 109 traveled the world in the early part of its life, from Great Britain through Europe into Asia and Africa, leaving its tracks in 22 countries. It traveled through Europe and the Balkans to Afghanistan, Pakistan, and India and then returned by way of the Middle East and North Africa to Morocco, across the Straits of Gibraltar and into Spain. It survived hurricanes and the ravages of time and eventually ended up in the hands of Lanny Clark, a man who devotes himself full-time to the restoration of these timeless vehicles on his farm in Vermont. His reputation in the Rover world is stellar, and this car has gone through a complete frame-up restoration to its original condition and is ready to go anywhere. Imported. While this model is sold, Clark’s shop has a number of other restoration projects on offer. Far more tasteful than the dime-a-dozen white Hummers favored by today’s promgoers, this stretched Grand Wagoneer is a limousine with a serving of class and a dash of absurdity. Check this baby out. 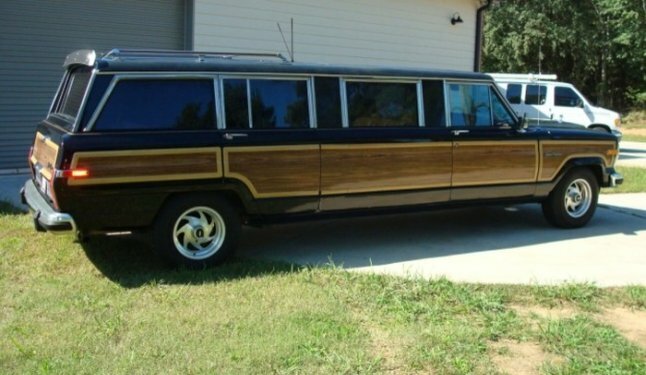 A stretched 1987 Grand Wagoneer that has only 43,267 miles, includes a 360-cubic-inch V-8 engine and four-wheel drive, it’s currently on offer for $24,900 from Back in Time Classics over at Hemmings. 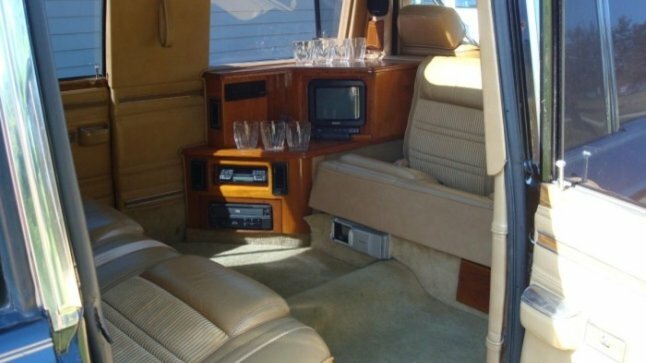 The passenger cabin inclues a wet bar, television and VCR and is capped with a sunroof. The black exterior includes the traditional woodgrain vinyl paneling and the vehicle’s only fault appear to be those awful wheels. While I’d be happy with my old ‘85, this seemingly well-done conversion would probably be a pleasure to ride in. An alternate view showing the unfortunate, but replaceable wheels. A 1984 Toyota Land Cruiser BJ60 Diesel. The Japanese answer to the American Jeep and the British Land Rover, the Toyota Land Cruiser was first conceived of in 1951. Launched in 1954, it continues to lead the Japanese carmaker’s SUV Line. I’ve always been partial to the models from the early 1980s. 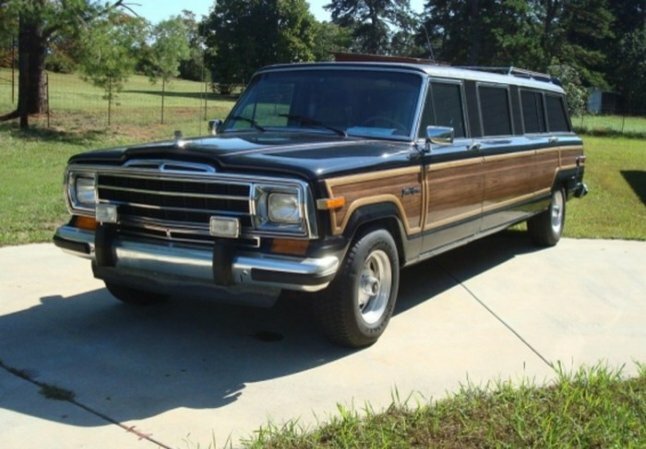 A friend drove a 1985 Land Cruiser that was roughly comparable in girth and ability to my 1986 Grand Wagoneer. The 60 series, launched in 1980, preserved the vehichle’s off-road performance capabilities while adding a number of comforts, like air-conditioning, to better compete in the marketplace. 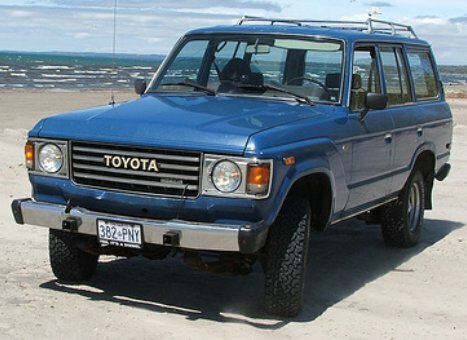 The 60 series changed little between 1980 and 1990 when production ceased. Only small details, like the change from circular to square headlights for the 1988, 1989 and 1990 models, were altered during the series’ run. Check out this terrific 1984 model, owned by a gentleman from Ontario.